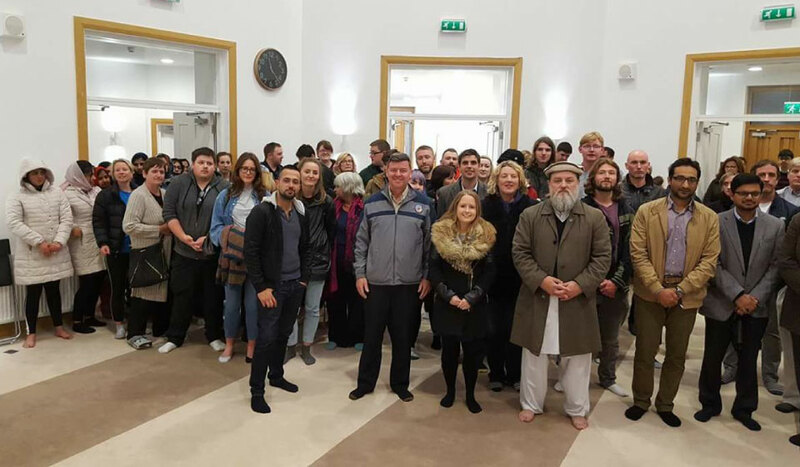 A solidarity rally organised by the Galway Anti Racism Network late on Monday night at the Ahmadiyya Mosque saw an amazing turnout. Almost 100 people showed up at 11pm, sharing tea and biscuits with the Ahmadiyya community and sending a strong message of support. Earlier in the day news broke that windows of the Mosque had been smashed the night before whilst worshipers were at prayer. Imam Noonan had already expressed throughout the day how much good will had been sent their way from the people of Galway. This late night gathering cemented the message that all tribes are welcome in Galway. GARN announced at the gathering that it will be holding an Iftar (evening meal ending Ramadan fast) at the Mosque on Sunday the 18th of June. The local anti-racism group also called on the people of Galway to stand with the Ahmadiyya community on Saturday when doing their weekly stall on Shop Street and to attend their open day on the same day. “On Monday alone, the people of Galway showed what solidarity really means on two separate occasions. Members of the settled community stood with Traveller families at the Cúl Trá halting site in Salthill in the afternoon and they gathered again on Monday night to stand against racism and intimidation. Important to note that Ahmadiyyans are not even considered Muslims by some sections of the wider Islamic population, and have been the victims of ISIS in many countries. Even the racism the perpetrators peddle is ignorant.